1933-34 V252 Canadian Gum Hockey was among the sport's first cards to be issued along with gum. The V252 set was distributed by Canadian Chewing Gum Sales, Ltd. The 50-card set offered collectors a chance to win a hockey game, but there was an element of skill and luck involved. 1933-34 V252 Canadian Gum Hockey card fronts feature a black-and-white player portrait. The pictures resemble an oblong octagon as the corners are cut away. A box below the player contains a letter inside a starburst and instructions to save the letter for a hockey game. The words to the left are in English, while a French translation appears to the right. A red field surrounds the player and the box. 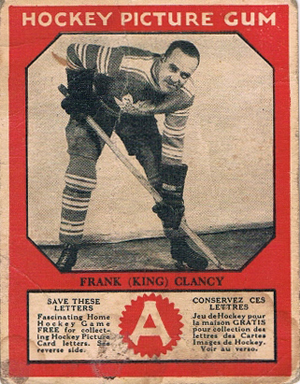 A Hockey Picture Gum designation appears along the top, and the player's name appears between the picture and the box. A white border surrounds the card. Backs start off with the player's name and team. The rest of the card is bilingual, with an English biography of the player beside a French version of the text. At the bottom is the description of the contest and an ad line for Canadian Gum. In order to obtain the game, collectors had to get the full names for five of the seven NHL teams, including the city, from the letters printed on the front of the cards. The set was also issued without numbers. These factors allowed the cardmaker to release the set without short-printing any of the cards. As a result, many 1933-34 V252 Canadian Gum Hockey cards are found today with the lower portion trimmed away. Cards that have been cut are worth a small percentage of those that aren't. Key cards to the set include Howie Morenz, Charlie Conacher, Aurel Joliat and King Clancy. 1933 34 CANADIAN CHEWING GUM V252 HOCKEY CARD NICK WASNIE ROOKIE KSA 3 VG NICE! !